The real toy soldiers are children, and it is estimated that 250,000 children are exploited every day by paramilitary, guerrilla, and state-run military groups. Nine countries have been identified as using child soldiers, and eight of those countries receive US military assistance. How could this be? 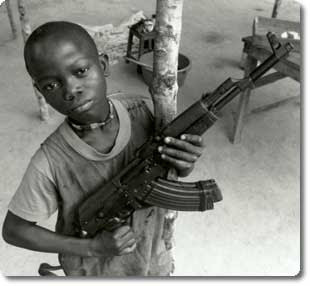 It is obvious that being a child soldier is detrimental to children’s social and emotional development. It is bad enough to live in a war zone, let alone become a fighter for whatever cause at a young age. This is no longer the age of Sparta, children have a right to be children. Rep. Jim Marshall (D-GA) has offered a bill to demobilize and rehabilitate child soldiers. The bill would limit US military aid to countries that use child soldiers. This only makes sense. As promised, this will be my last political rant for awhile; however, if you are wondering what the link between war and the environment is, click on PlanetThoughts.